The KRB Bar Separator allows for more efficient shakeout on the shop floor. Using an air bag system and electric vibrating motors, bundles can be spread out on the shakeout table faster than conventional methods. 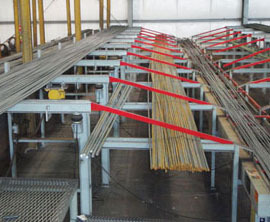 The airbag controls allow the operator to slope the table to release large bar diameters right onto the entry conveyor with very little material handling. Expect to see 50-100% improvement in productivity on larger bar sizes while reducing repetitive motion injuries. The Bar Separator is the perfect addition to your new or existing shearline for reducing the shakeout time needed on medium to large bar diameters.